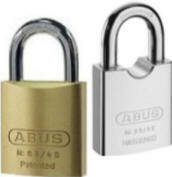 PADLOCKS are an icon of security We sell Abus, Lockwood and Master padlocks. Not many people know that padlocks have established themselves with a huge diversity of products for every conceivable application. When combined with high quality chains and security clasps, padlocks are used everywhere where flexible solutions are required. Hunter Valley Locksmiths also stock a great range of safety lockout padlocks and attaching tools. We also sell labels with names and photos. We also stock Danger Tags.